First, prepare the squash. Preheat the oven to 425 degrees. Wash the squash well with warm water, then cut off any knobs or spots. Slice the squash in half, lengthwise. Scoop out the seeds (I like to use a grapefruit spoon), then slice the squash into slices. I find it easiest to slice it with the flesh side face down on the cutting board. You want the slices to be no more than 1/4" thick (the thinner the slice, the crispier the result). Spread the squash in a single layer onto an ungreased baking sheet. Sprinkle with the olive oil and salt (adding more or less based on your preferences), then bake for 10 minutes. Use a rubber spatula or scraper to gently flip the pieces onto the other side. Bake for another 10 minutes, then remove from the oven. Set aside. To make the dressing, combine all ingredients in a small glass jar. Screw the lid on tightly, then shake vigorously, until all ingredients are combined. Set aside. To assemble the salad, first make a bed of kale on a serving dish. Add on the farro, pear, and roasted garlic. 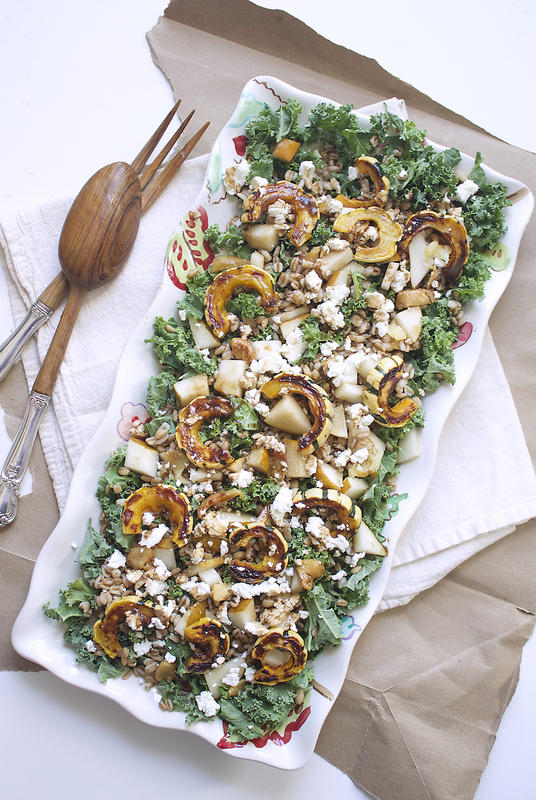 Finish off the salad by topping it with the squash slices and goat cheese, and then drizzle it with the dressing. Serve immediately. Serve alone for a lighter meal, or with sausages and a crusty bread for a heavier, more filling meal. This salad is vegetarian. To make it dairy-free and vegan, simply eliminate the goat cheese. Try substituting quinoa for the farro to make this salad gluten-free.